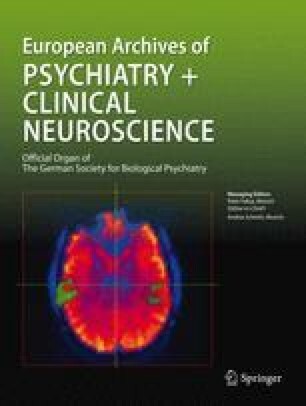 The hypothesis that differences in drug effects of risperidone and haloperidol on negative symptoms in schizophrenia are secondary to effects on positive, extrapyramidal, and depressive symptoms was investigated by means of an analysis of the data from the USA-Canada risperidone double-blind randomized clinical trial of 523 chronic schizophrenic patients. Regression analyses in the total sample and within treatment groups confirmed a strong relationship between changes in negative symptoms and the other variables studied (R2=0.50−0.51,p<0.001). Only depressive symptoms did not contribute significantly to these results (p>0.10). Path analysis showed that the greater mean change (p<0.05) of negative symptoms with risperidone compared to haloperidol could not be fully explained by correlations with favourable effects on positive and extrapyramidal symptoms. The relationship between shift in extrapyramidal symptoms and shift in negative symptoms failed to reach statistical significance; however, there was a clear tendency in the expected direction in both treatment groups.